Welcome to Violin & Books! I’m a multi-genre author and book reviewer who started to play the violin in my mid thirties. This magnificent instrument has brought a new wonderful dimension to my life–not to mention that it has been a GREAT challenge for a late starter like myself! What’s been really neat about learning to play the violin, among other things, is that it has inspired me enormously in my writing. All of a sudden, I have dozens of stories in my head, all violin-related in one way or another! I’ll be adding reviews and interviews as often as possible. 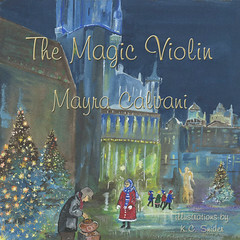 If you know of any great (or not so great) violin novels, please let me know so I may add it to my list. Thanks for stopping by and I hope you’ll visit again! The translation is quite bad, much is lost in translation, some descriptions are very vivid, e. g. the old man playing self-forgotten in the crowd. Quite entertaining books are Paolo Maurensig’s “Canone inverso” (http://www.amazon.com/Canone-Inverso-Paolo-Maurensig/dp/0753809494/ref=pd_bbs_2?ie=UTF8&s=books&qid=1195203069&sr=8-2) and “The Black Violin” (http://www.amazon.com/Black-Violin-Novel-Maxence-Fermine/dp/0743456858/ref=pd_sim_b) of Maxence Fermine. Good for plane trips and shorter strikes. Then two novels, both are (in my opinion) incredibly bad written. Finally Dieter Kühn’s “Beethoven und der schwarze Geiger”, covering a fictional journey Beethoven’s to Africa with his mate George Bridgetower, a famous black violinist in his time (Beethoven dedicated his Kreutzer-sonata to Bridgetower at the first). It’s a fairly witty portrait of both, puzzled together from anecdotes (http://www.amazon.de/Beethoven-schwarze-Geiger-Dieter-K%C3%BChn/dp/3596131707). 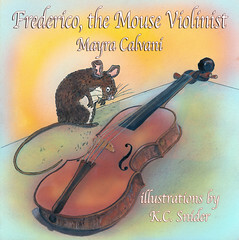 Now after such lousy books like the last two, a good movie: ever heard of El Violín (http://www.youtube.com/watch?v=l23wYKg7wjY)? Mexican movie from 2005, since your Spanish is perfect you’ll love it…! Anyway – I chose the wrong word with the Kühn book. It’s not witty at all, I meant cantankerous. Thanks so much for taking the time to share all this info. I appreciate it and will add the links ASAP. I haven’t posted anything lately as I’ve been busy with the “writing” part of my career, but I’ll be sure to update the site whenever possible.